AAA has the reminder of Arena Aficion, including Pagano vs Psycho Clown vs Pentagon. Elite hyped the Octagons as appearing on a Periscope during their show, so it’s probably the top two. Lucha Underground’s preview says it’s a heavy Medallion week. There probably isn’t a new IWRG show this week, since AAA & Chairo are running instead. 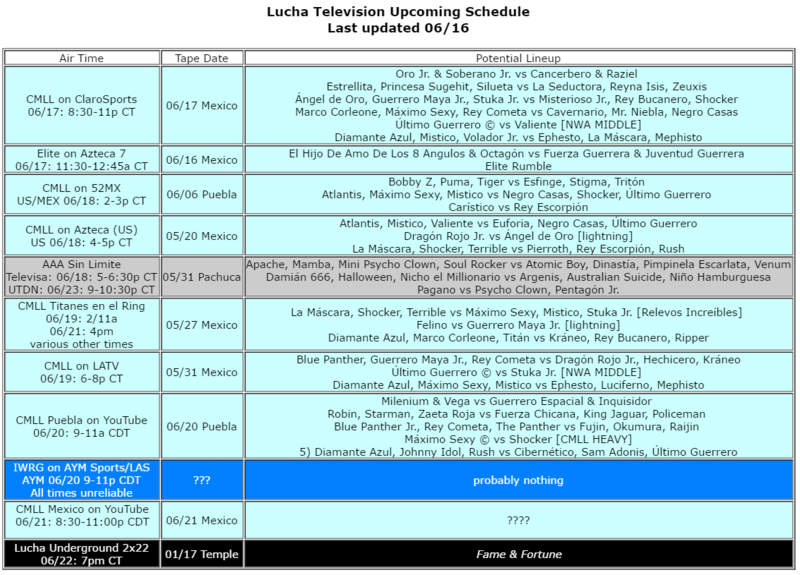 CMLL hasn’t released a card for Tuesday Arena Mexico yet. AAA tapes tonight in Arena Naucalpan. The main event is Psycho Clown vs Pagano, a rematch from Orizaba. It might only be the main event because they’re likely to tear up the ring (but then Wagner is likely to do about the same in the semimain), but it’s definitely going last. The last Pagano/Psycho match ended with Pagano giving Psycho a Spanish Fly thru a table on fire. I’m not sure what they can do to top that, but I’m sure they’ll try. It might involved the Perros, booked in tercera, getting involved in the match. The only match with something on the line is the trios title match, with the Xinetez defending against Aerostar, Drago and Bengala for the trios titles. It’d be a surprise if the challengers won, just because the overall direction of 2016 AAA has been strong rudo groups, and because this didn’t appear to treated as something important on the previous title shot. The case for a title change is AAA’s short on tecnicos – so much that Bengala has been main eventing some spot shows – and it’d help if he and the others were treated as bigger stars on TV to help that. I’d like the title change, I just don’t think it’s happening. Mesias versus Dr. Wagner Jr. is the return of an old feud which might be leading to something more with them down the road. Monster/Murder vs Lider/Pentagon vs Nicho/Damian also might be a preview; a three way trios match between those teams might make some sense. Dinastia, who had a stream of seemingly frustrated Twitter posts a few days ago, returns to TV by teaming with Pimpinela & Nino Hamburguesa against Taurus, Mini Histeria, and Super Fly. Mamba’s not facing her fellow exotico, and instead teaming with Taya against Faby & Mary Apache, which appears to be part of the story of the Apaches going for the main tag titles. Averno & Chessman aren’t on this show, but it’s close enough to Mexico City that it’s possible one or both might be around for an appearance. The show is listed as starting at 9pm (so don’t start checking Twitter for results until 9:30.) There’s no live stream, but there might be some Periscopes out there. The show itself should start airing on June 25. This week’s Wrestling Observer Newsletter says AAA had a meeting about holding TripleMania at the Forum in Los Angeles, but that plan is (long) dead and they’d be in Mexico City as normal. The WON says this would’ve only happened if they got TV in the US. AAA could not get TV in the US because their deal with Lucha Underground gives them the market exclusively, which suggests AAA either didn’t know that (unlikely) or thought they could get that changed (possible?) Even if the AAA show aired in the US, it’s hard to imagine it doing well in the US off less than a year of TV – especially this year of AAA TV – unless they were able to do a lot of local promotion or heavily leverage Lucha Underground popularity. Still, returning to the US (and LA in particular, a hot market of AAA’s first peak) has been such a goal that just accomplishing it might have been satisfying. Angelico says he’s in the last stage of rehab and will be back soon. Elite runs tonight. There’s no Liga Elite matches, as one tournament is again pre-empted for an another tournament. Tonight is a eight man Elite rumble for the one spot for a Mexican luchador in next week’s Elite international tournament. Participants are Mascara Dorada, Atlantis, La Mascara, Rush, Caristico, Cibernetico, Xtreme Tiger, Volador Jr., Diamante Azul, and Rey Escorpion. The last Elite Rumble was a battle royal with the last two going to a pinfall, so those are maybe the same rules here. Hoping I’m wrong and they do something different this time, because the Elite rumble they ran for the heavyweight title wasn’t any good, even before the lame finish. It was just a longer version of the usual horrible battle royal CMLL does. (Forget the suspension, why would your put Rush back in one of those after he threw the match last time?) Elite is strange and hard to predict, but given the Mexican rep may be one of the few people fans can actually identify, they need to have as big a star as possible win this. It’s probably Caristico’s match, though I guess Atlantis and Volador might have a shot. The rest of Elite card are normal tag matches. The big draw is supposed to be the Guerrera (Juvi & Fuerza) versus the Octagons. It doesn’t seem like the Hijo del Octagon story has meant as much as it did a couple months ago; there isn’t much media attention outside of the usual lucha libre places. The one thing going for him is he definitely won’t be the worst wrestler in the match as long as he’s teaming with Octagon. The match is more interesting to see how it’s handled: can they call him Hijo del Octagon? can the match air? Octagon’s match was skipped from Elite last time. The other matches, which may or may not air, include the odd team of Flamita, Golden Magic, and Hijo de Dos Caras taking on Magnus, Magno and Hijo del Medico Asesino. The best match on the show may be an Fujin, Raijin, Okumura versus Emperador Azteca, Metaleon, and Rey Cometa segunda. The opener is Astral & Electrico vs Pierrothito & Pequeno Violencia; Violencia usually makes things worse, but there seems to be less restrictions on Elite shows and that might balance it out. The show will air as usual on Friday. Elite might also be making the rest of it’s International tournament official tonight, or on it’s TV Friday, or on a press conference next Wednesday. The tournament seems to have the usual amount of Elite clarity and confusion: Leo Riano says Hernandez was as surprised as everyone else to see his name announced and has no plans of leaving AAA. Hernandez was listed as representing Puerto Rico, which was strange on it’s own, and it should not be too hard to find a replacement. It’s just very strange he was announced if he hadn’t been contacted at all. At Monday’s Elite press conference, Rush told Mas Lucha Dragon Lee was the first Mexican WWE invited to participate in the Cruiserweight Classic. Lee turned it down, Rush says, because he was going to be too busy this summer. (He’s ended up too hurt instead.) Rush was also very positive about Sombra in NXT, and critical of Mexican fans being hard on him for not having perfect English. At the same time, Rush said he didn’t want to go NXT because he’d have to change (like Sombra now being Andrade Cien Almas) and CMLL was the best promotion. Psycho Clown won the Arena Queretaro four way match with Pagano, Pentagon and Texano, thanks to a Pentagon foul on Pagano. CMLL hypes Kushida appearing on the Lucha World Cup. LuchaWorld has the latest Lucha Report and the interview with Volador Jr., who gives his take on Ospreay/Ricochet. Segunda Caida reviews Aeroboy vs Black Terry. ESTO interviews Marco Corleone about the Gran Prix and the international stars coming to Mexico. AyTV has a short history video on Arena Mexico. What happened: Cibernético & Atlantis picked up 3 points. Rey Escorpion’s feuding with Golden Magic, and maybe Diamante Azul & Carístico are involved. What was good: The main event, maybe. The undercard highlights looked good.